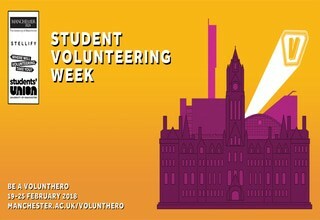 The University of Manchester and University of Manchester Students’ Union have teamed up again to recognise our student volunteers and to encourage those who don’t already volunteer to give it a go. When it comes to volunteering there’s something for everyone, so during the week we will be encouraging students to sign-up to our Volunteer Hub, a database of over 400 volunteering opportunities of all varieties. We’ll be hosting a variety of events throughout the week, including a volunteering road show. We're going out and about on a volunteering tour around campus and in Fallowfield, signing students up to the Volunteer Hub and providing opportunities to win lots of prizes! Wednesday 21 February 2018 sees the return of our Big Action Day! This year we will be transforming spaces across Fallowfield and Withington, focusing on student civic engagement. We’ll be based at St Chad’s Church in the heart of Fallowfield, where there will be a variety of different tasks available; from erecting a fence in the community wildlife garden and clearing the pond, to creating a new storage area and photographing the church’s interior. These activities contribute positively to civic life and give students the opportunity to get involved within their local community. Students can pop in for an hour or attend the whole day. Take a look at this video to see what we got up to last year! Across Student Volunteering Week there will also be a variety of information sessions and opportunities to get advice about volunteering both locally and overseas, so that any student can give volunteering a go and find the perfect opportunity for them. For more information about everything taking place please go to www.manchester.ac.uk/volunthero. During the week we’ll be distributing around 2000 thank you cards and badges to show our appreciation to all of our incredible volunteers. We will be encouraging students and staff to share their ‘Thank Yous’ on Twitter, using the hash tag #SVW2018, so you can keep up to date with some of the students receiving cards throughout the week.